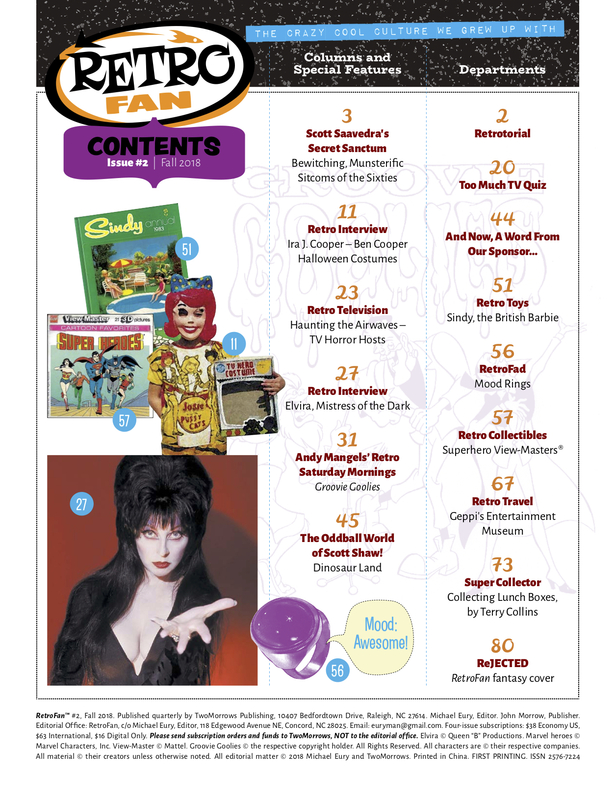 RetroFan is Michael Eury’s new TwoMorrows mag centering on all the far out TV shows, movies and collectibles from yesteryear. It’s a quarterly pub and Issue #2 is due 9/26. The theme? Well, Halloween obviously — though there’s more than that. And I gotta tell you, there’s a ton to choose from here — and maybe we’ll even dip back in as we get closer to Halloween. But for now, let’s take a look at a feature that anyone who reads 13th Dimension will dig — a history of superhero View-Master reels. Of course, there were many more sets besides that one and historian Robert V. Conte has put together an incredibly detailed, highly illustrated piece on the classic plaything. This excerpt, which was edited for flow, only scratches the surface of what Robert wrote, so make sure you check out RetroFan #2 itself. You’ll be glad you did. Some View-Master collectors cite 1958’s Mighty Mouse (B526) as Sawyer’s Inc.’s first entry into the “Superhero” genre. And arguably, 1963’s Flash Gordon in “The Battle for Mongo” (B583) could be considered the second. But the third and perhaps the definitive superhero packet released—and the first featuring a live-action character—was Batman (B492) in 1966. Adapted from the 20th Century Fox/Greenway Productions/ABC television series starring Adam West as the Caped Crusader and Burt Ward as Robin, the Boy Wonder, Batmania had swept the country as Beatlemania had just two years before. Batman merchandise was everywhere and this packet was a home run for Sawyer’s. Episodes 19 and 20—The Purr-fect Crime and Better Luck Next Time—guest-starred actress Julie Newmar as the series’ first Catwoman. A little-known fact is that when Episode 19 originally aired on March 16, 1966, ABC pre-empted it due to an emergency regarding the NASA spacecraft Gemini 8. Fortunately all astronauts involved, including Neil Armstrong and David Scott, landed safely. However, Bat-fans were upset to have missed much of the episode, and expressed their discontent with thousands of letters and phone calls to ABC affiliates nationwide. In those days, months would pass before an episode of a television show would air again. Some speculate this benefited sales of the Batman View-Master packet as, for television viewers who just couldn’t wait that long to watch “The Purrfect Crime” again, it was the next best way to learn what had happened to the Dynamic Duo before the stunning climax. 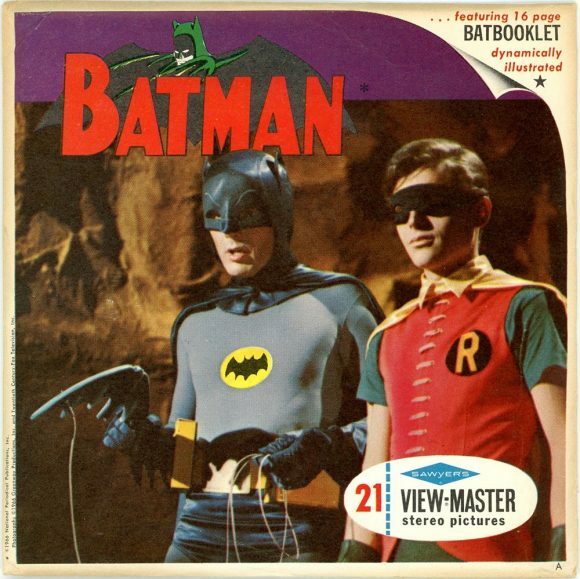 View-Master’s first Batman three-reel set, which included an official 16-page “Batbooklet,” was one of the most successful in its history, and remained in print until the late Eighties. The next View-Master superhero title was The Green Hornet in “Programmed for Death.” (B488) Also produced by the same studios that brought Batman to television, this new series starred Van Williams as Britt Reid/Green Hornet and martial-arts master Bruce Lee as Kato. Unfortunately, this television show did not have the same charm as Batman and lasted only one season. Alas, Sawyer’s manufactured the title once and it was never re-released. Today, these three-reel packets, including a 16-page booklet with spot-green ink, are considered scarce and highly collectible, primarily due to Lee’s cult status in pop culture after his mysterious death in 1973. GAF, which had purchased Sawyer’s, soon introduced a new look for their packaging and the first superhero View-Master packet to benefit was 1970’s Superman Meets Computer Crook (B584). While some collectors believe this three-reel packet is loosely based on The New Adventures of Superman (the Filmation animated series that aired Saturday mornings on CBS from 1966–1969), it features an original concept of superb, color line art imposed over real backgrounds. The villain, Mikro, looks identical to the Man of Steel’s arch-nemesis, Lex Luthor—reportedly the result of GAF not licensing the name. This title would remain in print for over 15 years. The next super-packet was 1975’s Shazam! (B550), featuring the original Captain Marvel, Mary Marvel, Captain Marvel Jr., and their evil arch-nemesis with the same superpowers, Black Adam! The Marvel Family had been reintroduced to comic-book audiences after being dormant for almost 20 years, followed by a live-action television show that started shortly before this packet’s release. Interestingly, Shazam! was the first title in this genre to be created completely from artwork, and featured word balloons as “spoken” by the characters. It is also the first superhero title to utilize an actual logo on each reel! In 1976, GAF introduced the Good Guys Gift Pak—a round canister including a standard View-Master viewer with eight reels – condensed versions of the aforementioned Batman, Shazam! and Superman packets, plus two exclusive reels: Aquaman in The Menace of the Land Beasts and Wonder Woman in Peril Over New York. To date, this would be the only time these two heroes appeared in their own View-Master reels. By 1977, GAF believed it had enough DC Comics titles in print. The company experimented with superhero-related titles like Filmation’s live-action Isis (T100) and Sid and Marty Kroft’s ElectraWoman and DynaGirl (H3), but sales were lackluster. Fortunately, customer letters and feedback from sales reps indicated the superhero market was growing more than ever, particularly with DC Comics’ top competitor, Marvel Comics Group, whose comic sales were outshining much of the DC line. Before long, a deal was reached and a new chapter in View-Master history was about to unfold. By the late Seventies, superheroes published by Marvel Comics Group had a tremendous presence on television. The Marvel Super Heroes, Spider-Man and Fantastic Four cartoons from the Sixties were in heavy syndication; a live-action Spider-Man segment appeared in Spidey Super Stories on the Children’s Television Workshop’s The Electric Company and later on his own weekly primetime program; and the Incredible Hulk starred in his own live-action TV show. Made-for-television movies starring Doctor Strange and Captain America only helped propel the popularity of characters created by Stan Lee, Jack Kirby, Joe Simon and Steve Ditko. View-Master’s Marvel sales hit a milestone for GAF and, for the first time ever, it produced two superhero packets featuring one character—Spider-Man! From 1977 through 1980, GAF also produced View-Master titles featuring Thor, Captain America, Iron Man, Doctor Strange, the Fantastic Four, the Hulk, the Sub-Mariner and Spider-Woman. View-Master also released the Marvel All-Star Gift Pak, with a viewer and seven reels, including edited versions of Captain America, Doctor Strange, Hulk, Spider-Man and Sub-Mariner. RetroFan #2 is due out 9/26 and will be available through comics shops, though some stores will get it later. You can also get it through TwoMorrows directly. Click here. Man! I had the Batman Viewmaster! Think ( had the Spider-Man one, too… Just those two though. The 3 D effect that view master created was really cool. BUT, the best part for me was seeing Batman in COLOR. I’m a 1st run kid who was glued in front of the TV twice weekly. Problem was that TV was a black and white set. Only the Batman ‘66 feature film and the occasional trip to grandma’s house provided me the opportunity to see Batman in color. View Mastet put Batman in color in my pocket (sort of) of course today the whole series streams to my phone. I owned first prints of Superman and Batman. I bought that Good Guys Gift Pak just to get the Aquaman and Wonder Woman disks (plus the Shazam ones I’d somehow overlooked).